Toast frozen waffles and let the children use cookie cutters to cut them into heart shapes. Then let the children decorate their waffle hearts by sprinkling on powdered sugar. in half for wings. Add rope licorice for antennae and candy hearts for eyes. 1. Blend cream cheese and yogurt till smooth. 2. Stir in strawberries and their syrup. 3. Pour into pie shell and place in freezer until set. Buy a box of plain unfrosted pop-tarts, then let the children ice the pop-tarts with vanilla icing. Then take a large conversation heart and place it in the top corner for a stamp. Let the children use cooking sticks or tubes of fine icing to write messages!! 1 cup of flour, 1/2 tsp. salt, 4 T. margarine, and 2 T. water. Form the dough into 16 to 18 balls. bake at 350 degrees for 20 to 25 minutes. When cool, fill the tart shells with strawberry jam or jelly. Extension: Sing the song below while making your Queen of Hearts Tarts. Flatten out biscuits, cut out a heart, then make as a pizza!! Heat caramels with cream in saucepan over very low heat, stirring constantly. Cool 10 minutes. Set pecans on lightly buttered baking sheets in clusters of 3.
about 30 minutes. Spread melted chocolate over caramel mixture. Makes 2 dozen. freeze until ready to use. Serve with biscuits, pound cake, croissants, muffins or waffles. Crushed ice and fresh mint, if desired. In mixing bowl, beat cream cheese, marshmallow cream and cinnamon until smooth. completely through. Pipe filling into strawberries. Refrigerate until serving. If desired, serve on a bed of crushed ice and garnish with fresh mint. Prepare sugar cookies according to directions on the package for rolled cookies. with frosting and top with a cutout cookie. Sprinkle with powdered sugar. meat and vice versa. Let the children place the cheese and luncheon meat on bread to make sandwiches. of deviled ham and mayonnaise. Then let them sprinkle alfalfa sprouts on their pink hearts for a lacey touch. a countertop. Then cut hearts out of the gelatin with a small heart shaped cookie cutter. for rings, etc. Bake at 375 degrees for 6 - 8 minutes, cool on wire rack. Makes about 15 hands. children mold it in the funnel. Place on waxed paper to cool completely before wrapping. Wrap kiss and strip in aluminum foil. Give as a gift to a special someone. In a large saucepan, combine first four ingredients. Cook and stir over medium heat until sugar is dissolved. until melted. Stir in chocolate chips until melted. Add chocolate bars and baking chocolate; stir until melted. Fold in vanilla and pecans; mix well. Pour into a greased 15-in x 10-in. x 1-in. baking pan. chill until firm. Cut into squares. Yield: 5 1/2 pounds. In a large saucepan, combine the first four ingredients. Cook over medium heat until all sugar is dissolved. Gradually add milk and mix well. Continue cooking until candy thermometer reads 248°F (firm-ball stage). microwave-safe bowl or double boiler. Drizzle over each cluster. Cool. Yield: about 4 dozen. boiler or microwave-safe bowl, melt chocolate chips, peanut butter and butter. Pour over the marshmallows. chill completely. cut between marshmallows. Yield: 3 dozen. Let the children assist you in making up a packet of vanilla and chocolate pudding. that even though they are different they are together a delicious pudding! and 1/2 Cup Peanut Butter in Microwave. Spread over Graham mixture & chill. process for about 30 seconds longer. Pour pudding mixture over caramel layer, covering evenly. decorative pattern. Sprinkle top of cake with remaining pecans. Chill, loosely covered until serving time. Have children help bake cupcakes in pink paper liners and prepare white frosting. and sprinkle with red sugar crystals or powdered sugar. Carefully remove the stencil to reveal a valentine. pans, here is a trick!! Make your strawberry cupcake mix and pour it into cupcake liners and place in pan. Then place a marble in between the liner and pan. Perfect Hearts!! Then have the children ice up their hearts!! Use a favorite recipe to prepare cake batter. Pour the batter into one round pan and one square pan. against the top two sides of the square cake to make a heart shape. Cover the entire cake with pink frosting and decorate it as desired. Sift flour, sugar, baking powder and salt into mixing bowl. Mix in shortening. liquid and egg whites and beat two minutes at low speed.Add cherries and nuts. Bake in 2 deep 9-inch greased layer pans at 375 degrees for 20 to 25 minutes. Cool. Cut layers into heart shapes using paper pattern. Spread with Pink Valentine Frosting. cubes placed in clear plastic cups. Makes 24 small servings. 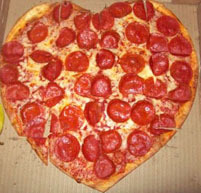 or order a heart shaped pizza from Papa Johns.